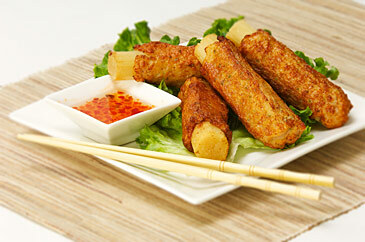 Deep fried egg roll filled with carrots, onions, cellophane noodles and jicama. Served with plum sauce. Pork or vegetarian. Fresh roll with lettuce, vermicelli noodles, carrots, bean sprouts in rice paper. 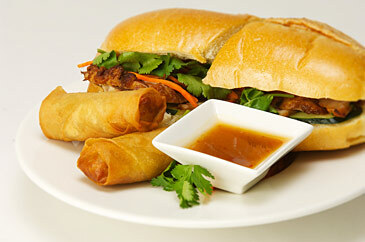 Served with peanut sauce or with a gluten-free sauce. 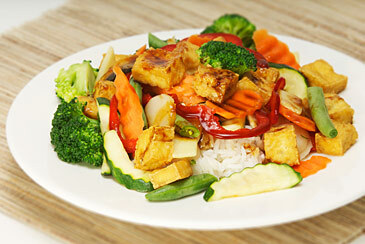 Choose from pork & shrimp, beef, chicken or deep fried organic tofu. WF. Baby back ribs cooked in our Woodstone oven served with scallions and cilantro in our delicious house-made honey hoisin sauce. WF. Lightly battered shrimp tossed with a sweet creamy sauce on a bed of cabbage. Topped with roasted walnuts and peanuts. WF. Deep fried cakes with jumbo prawn and black eyed peas. Served with lettuce and blended fish sauce. Served with a side of peanut sauce. WF. Tossed lightly with sugar and served with plum sauce. WF. Filled with pork and shrimp. Topped with sesame oil & toasted garlic. Saigon style noodle soup with prawns, BBQ pork and ground pork. Choice of rice noodle, egg noodle or combination. Also available in a dry style. Spicy beef broth seasoned with shrimp sauce and lemongrass. Come with large round rice noodle and beef. Spice level: 1 to 5 stars. All soups are topped with chopped cilantro, green onions and white onions. A side of bean sprouts, lime wedges and green chili accompanies. (Gluten-free sauce available). Wheat-free items. With deep fried organic tofu or fresh organic tofu. Choice of beef broth or vegetable broth. With medium-rare eye round beef, well-done beef steak and beef meatballs. Shredded green papaya, grilled shrimp, pickled carrots, basil, crispy shallot & roasted peanuts. 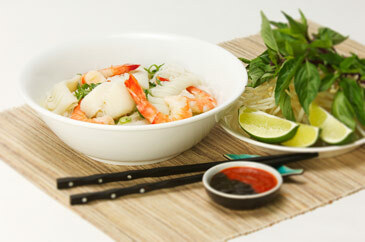 Steamed vermicelli rice noodle, served on bowl with bean sprouts, fresh lettuce, cucumber & pickled carrots. Topped with ground peanuts and green onions. Blended fish sauce or soy sauce on the side. Wheat-free items. Served with sweet potato fries OR two (meat or vegan) egg rolls. With ground pork spread, butter, cucumber, pickled carrots, cilantro and green chili. Choose from grilled chicken, grilled lemongrass pork, grilled lemongrass beef or BBQ pork. With avocado and deep fried sandwich. Served with a side of homemade peanut sauce. Steamed rice served with lettuce, cucumber, fresh bean sprouts & carrots. Served with white or brown rice. Choice of grilled chicken, grilled lemongrass pork, BBQ pork or grilled lemongrass beef. WF. Steamed rice served with a choice of meat, grilled shrimp skewers, organic sunny-side-up egg, lettuce, carrots, fresh bean sprouts and cucumber. 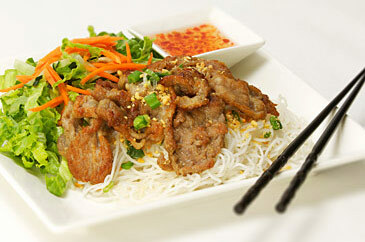 Choose from grilled chicken, grilled lemongrass pork, BBQ pork or grilled lemongrass beef. WF. Fried rice with bean sprouts, carrots, green beans, onions, corn and peas. Topped with roasted sesame. Tender pieces of meat, rich green curry coconut sauce and fresh seasonal vegetables served with steamed rice. Topped with roasted sesame. With lemongrass organic tofu, green beans, mushrooms and 2 veggie egg rolls. All natural cubed beef seared with sauteed onions, red peppers, green beans and roasted sesame. Served with a side of rice or bread. A platter of prawns, scallops, calamari, vegetables and roasted sesame in ginger sauce. Served with a side of steamed rice. WF. 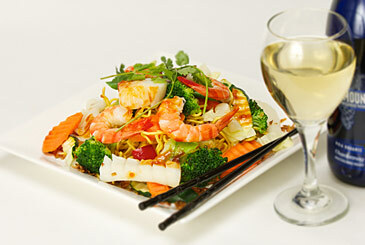 Shrimp, scallops, calamari & seasonal vegetables in sweet and sour cilantro sauce on a bed of crispy noodle. Also available in meat-free version with tofu & vegetables. Rice noodles stir fried with bean sprouts. Topped with sesame. Choose from chicken, beef or tofu. White sticky rice served with soy sauce, Chinese sausage, grilled chicken, green onions and fried shallots. WF. Try the vegetarian version with organic tofu. Baked banana served with warm tapioca coconut sauce. Toped with roasted peanuts and sesame. WF. Mung bean pudding with sweet sticky rice, topped with tapioca coconut sauce, roasted sesame and peanuts. Served warm. WF. 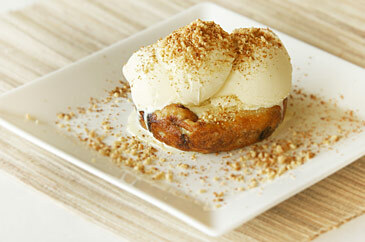 It’s a melt-in-your-mouth dessert with creamy coconut, banana and bread. Topped with roasted peanuts. Add ice cream for more yummy-goodness. Choices for sauce include cilantro-pesto, spicy green curry, cilantro-garlic, or Vietnamese BBQ sauce. Grilled chicken, cilantro, mushrooms, red onions, tomatoes, jicama and mozzarella cheese. Vietnamese sausage, red onions, jicama, roasted red bell peppers and mozzarella cheese. Natural beef, red onions, jicama, roasted red bell peppers, cilantro, tomatoes and mozzarella cheese. 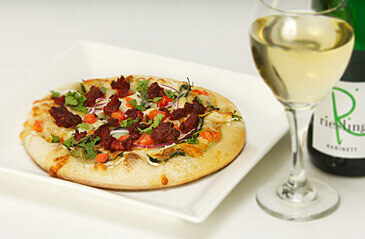 Natural pork with roasted red bell peppers, jicama, onions, cilantro, tomatoes and mozzarella cheese. Vietnamese BBQ pork with roasted bell red peppers, jicama, onions, cilantro, tomatoes and mozzarella cheese. Thinly sliced Vietnamese sausage, chicken, BBQ pork, onions, tomatoes, red bell peppers and mozzarella cheese. Tofu, cilantro, onions, jicama, mushrooms, red bell peppers and mozzarella cheese. Roasted red bell peppers, onions, jicama, tomatoes, broccoli, bean sprouts, mushrooms, Vietnamese basil and mozzarella cheese.